One of the biggest advantages we’ve discovered in our 15 years of living overseas is the constant availability of travel and adventure … and a big benefit is how remarkably little it costs. We’ve written before about the low cost of bus travel in Ecuador, where we live. For about $2.50 we can travel by bus from our home in Cotacachi in northern Ecuador to the capital city of Quito, two hours to the south. If we want to hire a private driver, we’ll typically pay $50 to $60 for that. Domestic airfares are low, too. You’ll rarely spend more than $50 to $70 to fly anywhere in the country. So if, on a whim, we want to take a weekend junket to the city…or to the Amazon basin and one of Ecuador’s many rainforest lodges, or to a Pacific coast beach town … we can do that both easily and affordably. Case in point … a few weekends ago, we took a Sunday trip — from 7 a.m. to 6 p.m. — to visit a national park in Ecuador’s Carchi province that’s home to one of the most unique ecosystems on the planet. This tour cost just $25 apiece. (The U.S. dollar is Ecuador’s official currency, in case you’re wondering.) This included our transportation and driver/guide. We spent another $10 for our park entry and our eco-guide. Along the way, we stopped for a breakfast of grilled cheese toast, eggs, fruit, yogurt and granola, coffee, and fresh-squeezed juice — just $4. Lunch was a choice of fresh-fried trout or grilled chicken with salad, rice and potatoes, more delicious juice, coffee, and homemade ice cream for dessert. The grand total for that feast was just $6 apiece. Of course, just living outside the U.S. can be a daily adventure for a couple of U.S. Midwesterners like us, and we suspect the same is true for most North Americans we know who have moved abroad. But the opportunity to spend the day or weekend visiting someplace amazingly exotic and seeing something that you’ve never seen before … often right on your doorstep and often for less than the price of a fancy dinner back home … sets the adventure bar pretty high for us. This most recent adventure took us up into the high-elevation Andes Mountains to explore an ecosystem that only exists between 11°N and 8°S latitudes, mostly in the northwest corner of South America. It’s called the páramo, and it’s a kind of alpine tundra that exists between 9,000 to 15,000 feet above sea level … from down where the trees start to get weird and stunted up to where the permanent snow line starts and almost nothing grows. In Ecuador’s El Angel Ecological Reserve, the local páramo is an amazing wetland thanks to a convergence of air currents that brings fog and rain almost daily. A two-hour walk through the park takes you through two of the three main zones of a páramo ecosystem—first a walk through a stunted, twisted, shaggy barked forest of polylepis trees, some of the slowest-growing trees in the world—trees that only grow at high elevations. Climbing up, the forest soon gives way to a zone of grasses and stunted frailejones, a plant that looks like a cross between a dwarf palm tree and a cactus. We thankfully didn’t walk up into the third zone of the paramo up near the snow line…but we could see it high above us. Aside from the fact that the páramo only exists in very few places on the planet, it is even more special because, here in Ecuador, it forms a kind of huge geological sponge. The plants and soils trap the constant upper-altitude rain and fog and release it slowly into streams and rivers that flow down into Ecuador’s Andean valleys, supplying much of the fresh water for entire regions of the country. In fact, there are places in the El Angel Ecological Reserve that look like broad, grassy avenues—a kind of Alpine mirage. Beneath the pathways, underground waterways flow through fine sandy mud…you can jump on the ground and feel it quiver and shake as though you’re walking on a sponge. The opportunities to visit places like this in Ecuador are legion thanks to the little country’s geography and latitude. 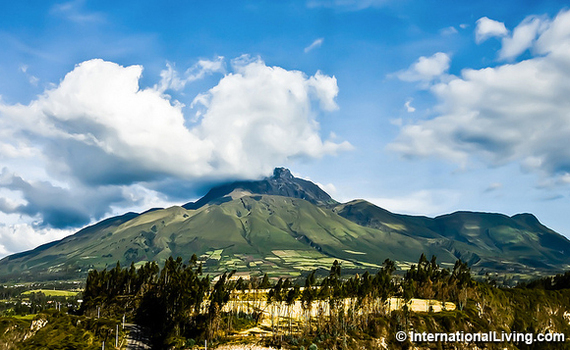 The Andes Mountains run right down Ecuador’s spine, from north to south. From the beaches at sea level on the Pacific coast, the country rises eastward to some of the highest mountain peaks on the planet before descending again into jungles from which spring major headwaters of the Amazon River basin. The diversity is incredible, which makes for some really diverse and amazing opportunities to visit places unique on the globe. And luckily for us, it’s more than affordable to explore Ecuador. It’s easy enough to find comfortable hostels — yes, with private bathrooms — for anywhere from $20 to $40 a night, breakfast included. And you can spend more for more luxurious digs with all meals and tours included. This isn’t just true of Ecuador, of course. Expats living overseas all have a world of such adventures to choose from. In eastern Mexico, the ruins of the entire northern Maya empire are day trips apart…and they sit atop an amazing geographical region of underground rivers and cenotes to explore. In Belize, the second-largest reef system on the planet lies just a few hundred yards offshore. In Costa Rica, a significant portion of the entire country is national parkland with some of the most bio-diverse flora and fauna anywhere. The list of amazing places that expats have access to is as vast and diverse as the places they settle. It’s part of what makes retiring overseas such a worthwhile experience … it can be easy and affordable to indulge your inner explorer.